Snoodz'n'Mitz, hats and gloves that stay put all day! Snoodz'n'Mitz snoods and mittens are a cunning alternative to those easy-to-lose hats and gloves! Is it a hood? Is it a scarf? Are they mittens? Are they wristwarmers? They're all of those things! Clever, huh? 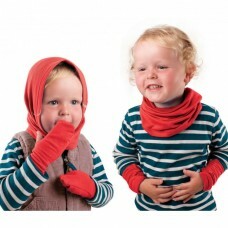 Made in Britain by Skibz, this cunning little combination of Snoodz'n'Mitz is the coolest way to keep little ones warm; the stay-put hats and mits that aren't so easily lost! A snood that easily transforms from neck warmer to hood, and mits that roll back into wrist warmers make getting out and about in the cold less of a fuss. No need to take toddlers hats and gloves on and off as you go in and out, and no more missing mittens! Suitable for all seasons, for wet welly walks and breezy beach days, this is the must-have baby accessory, available in blue, red and pink.